"It'll be nice to spend time with dad, I didn't get a lot of time with him growing up." Netflix has debuted the full-length trailer for Noah Baumbach's The Meyerowitz Stories (New & Selected), which arrives on Netflix next month. This is Baumbach's new familial drama that first premiered at the Cannes Film Festival this year. This quaint indie dramedy is about three siblings who reconnect and come together in New York for an event celebrating the artistic work of their father. Dustin Hoffman plays the father, a sculptor who has always been the dominant member of the family. Emma Thompson stars as his wife, and the siblings are played by Adam Sandler, Ben Stiller, and Elizabeth Marvel. I did not care for this film when I saw it in Cannes, but others may still enjoy it. This trailer plays up some of the more absurd, comedic moments. You can still watch the first teaser trailer for Baumbach's The Meyerowitz Stories here, for more footage. 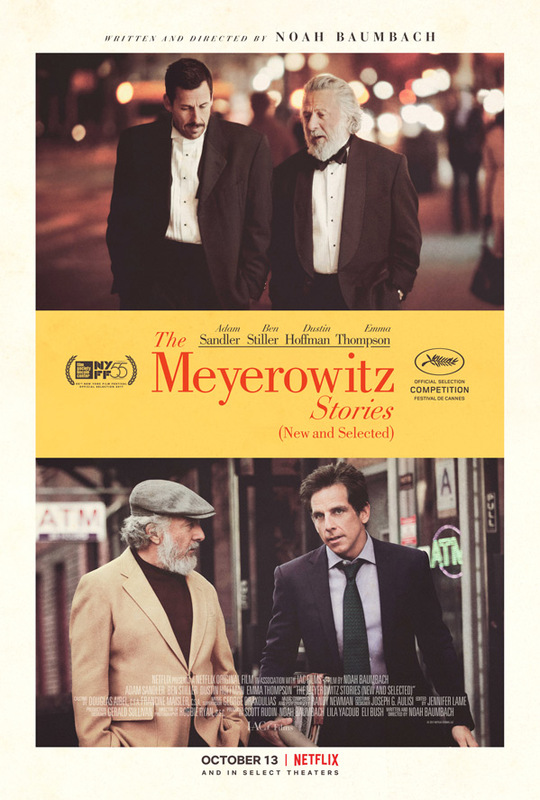 The Meyerowitz Stories (New and Selected) is the emotional, and comic intergenerational tale of adult siblings (Adam Sandler, Ben Stiller, and Elizabeth Marvel) contending with the long shadow their strong-willed, sculptor father (Dustin Hoffman) has cast over their lives. The Meyerowitz Stories is both written and directed by acclaimed American indie filmmaker Noah Baumbach, director of the films Kicking and Screaming, Mr. Jealousy, The Squid and the Whale, Margot at the Wedding, Greenberg, Frances Ha, While We're Young, Mistress America, and De Palma previously. This first premiered in competition at the Cannes Film Festival earlier this year. Netflix will release Baumbach's The Meyerowitz Stories (New and Selected) in select theaters + streaming online starting October 13th this fall. Who wants to see this film?